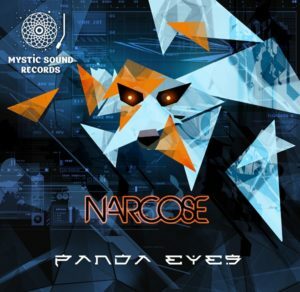 Mystic Sound Records proudly presents Panda Eyes, the full-length debut album from U.K.-based Narcose (Graham Roberts). If Hayao Miyazaki produced a movie with Terry Gilliam and George Lucas, Oskar “Panda Eyes” would be in charge of the soundtrack. Here we find a new drama unfolding; beautiful women are involved (or at least their voices are pure and intriguing), a tangle of adventurous events is rolling and rolling, and there is an almost endless assortment of nuances to discover—just catch them if you can! Space travel is another joyous feeling to be experienced here—and who knows, maybe you will manage to locate the wormhole! The bass section makes it kicky dramatic, and the main point is that all is happening with this dubby mood, as if Lee ‘Scratch’ Perry were providing the shooting crew with cookies. Tune in and listen to the very end even if your “been there, done that” mind tells you to skip to the next track! Are you ready? Lights, camera, action, music! Mastered by Colin Bennun, approved by Manifold Mastering Studio. Cover art designed by Alex Tooth. MP3 Download | FLAC Download | WAV Download · Download count: 9,443. Have been looking forward to this release since first hearing on Soundcloud and wow, was it worth it. So good, wonderful music. Thanks Graham and Ektoplazm! its just masterpiece ! congratulations ! 100% with 30 votes! Congratz!!! This is great. It´s like Ott, Bluetech and Kalya Scintilla somehow made a child. Great album, thanks for all your hard work Narcose. and also thanks to Ektoplazm – this is why we love you! the melodies weren’t grabbing me..
Amazing release ! yeah !